What Are Query Ranking Expressions? The Coveo .NET Front-End search interfaces include many optional elements that you can activate from the .NET search interface, independently for each search interface. Refer to the following subsections to learn how to reach this page and to review detailed descriptions of the available options. Access the Coveo .NET Front-End Interface Editor (see Opening the .NET Interface Editor). In the .NET search interface, click the Search Interfaces tab. In the Current Interface drop-down list, select the search interface for which you want to activate options. In the navigation panel on the left, select Options. Refer to the following figure and table to understand the options available under Search Box. You can change or remove the logo (see Changing the Logo Appearing in a Search Interface With the .NET Interface Editor). The Advanced Search link appears when the Enable advanced search link option is selected. The Preferences link appears when the Enable Preferences link option is selected. The Select All and Clear All controls as well as check boxes for the available collections appear when the Display collection checkboxes option is selected. Enable the welcome search page Select to display the initial search interface page when the user accesses the interface the first time of each session (before any query is performed) or when the user launches a query with an empty search box. The initial search page presents no results and can have a different layout. This option is useful for search interfaces where it does not make sense to run a default query when a search session is initiated. When this option is cleared, consider selection the Always execute the query option. Enable Preferences link Select to show the Preferences link above the search box. Users can then click the link to access the Preferences page where they can personalize search interface options (see Modifying .NET Search Interface Preferences). The Coveo administrator can also set default preferences (see Modifying Default .NET Search Interface Preferences). Enable advanced search link Select to show the Advanced Search link above the search box. Users can then click the link to access the Advanced Search page where they can build a complex query using multiple parameters (see Using the Advanced Search Page in .NET Search Interfaces). Enable saving queries and filters Select to show the Save: Query | Filter links at the bottom of the default search interface facet zone. Users can click these links to save and reuse queries and filters (see Using Saved Queries and Filters in .NET Search Interfaces). Enable searching within results Select to show the Search Within Results link at the top of the default search interface facet zone. Users can click this link to refine results starting with the current results (see Searching Within Results in .NET Search Interfaces). Enable search as you type This option only applies to Coveo search boxes integrated in SharePoint or in other types of websites. Select the option to activate the search results that appear in a drop-down list below the search box while the user types a query. Consider operators in lowercase as words By default, the terms AND, OR, NOT, and NEAR (as well as their French counter parts ET, OU, SANS, and PRES) entered both in uppercase or lowercase in the search box, are interpreted as operators (see Search Prefixes and Operators). It is recommended to select this option so that these terms are interpreted as normal words when they are included in lowercase in a query. Display collection check boxes Select to show, below the search box, the Select All and Clear All controls as well as check boxes for each collection available for the current search interface. This option is useful for a search interface that searches in several collections as in the All Content search interface. The user can then see and select to which collections the query applies. Include interface language in score calculation Select to increase the ranking of documents whose language is the same as that of the search interface. Note: The document language is one of the numerous ranking criteria. Selecting this parameter only boosts the ranking according to the weight of the language criterion (see Understanding Search Results Ranking). Example: When indexed documents are available in English, French, German, and Spanish, and the search interface is in German, the ranking of German documents in the search results will be increased. Note: The Coveo search interfaces are available in a few languages (see Supported Languages). The .NET search interface settings found in Search Interface > Features > Culture determine the language in which the search interface appears. CES 7.0.8047+ (December 2015) When selected, the documents returned by a query must always contain at least one of the query terms (words, numbers, etc.) instead of necessarily all of them. By default, the AND operator is entered between query terms. Example: The query Coveo OR Search finds documents containing Coveo or Search, or both. Refer to the following figures and table to understand the options available under Result List. RSS link appears when the Enable RSS feeds option is selected. Link link appears when the Enable the query link option is selected. The Microsoft Excel XML data source box appears when the Enable Microsoft Excel XML data source inside the query link box option is selected. Messages indicating the current result refinement appear when the Display query comments option is selected. Mini-results appear when results are found in other search interfaces for the current query and when the mini-result features is enabled (see Enabling Mini-Results in Search Interfaces With the .NET Interface Editor). The Export to Excel item in the Do more menu appears when the Enable exporting to Microsoft Excel option is selected. The Search Within Results link appears when the Enable searching within results option is selected (under Search Box). The Cluster facet appears when the Enable search cluster facet option is selected. The Query | Filter links appear when the Enable saving queries and filters option is selected (under Search Box). Enable search cluster facet Select to make the Cluster facet appear based on results clustering (see Administration Tool - Result Clustering Menu). 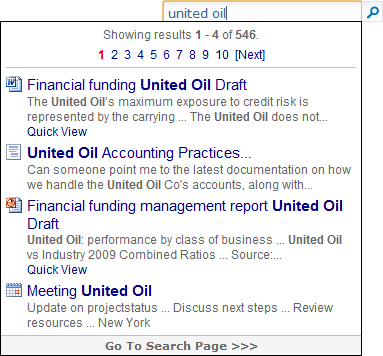 Users can then use this facet to refine their search results. Note: Ensure that result clustering is enabled in the index before selecting this option (see Enabling and Customizing Result Clustering). Enable RSS feeds Select to make the RSS link appear at the right end of the search box panel. Users can then click the icon to subscribe to a RSS feed for specific queries (see Receiving Updated .NET Search Results through a RSS Feed). Enable the query link Select to make the Link link appear at the right end of the search box panel. Users can then click the icon to view, copy, or edit the complete query (see Viewing the Extended Underlying Query). Enable exporting to Microsoft Excel Select to include the Export to Excel item in the Do more menu. Users can then use this menu command to export search results to the Microsoft Excel file format (see Exporting Search Results to Microsoft Excel in a .NET Search Interface). CES 7.0.7183– (November 2014) This option is obsolete. Selecting it has no effect. Note: CES 7.0.7256+ (December 2014) This option is removed. Select to display messages indicating the current refinement criteria from keywords, facets, and other refinement tools. The messages appear below the search box panel, typically in green, and include a link to clear the related constraint. This option is useful to help the user realize which refinement constraints are active. Note: The query comment feature has been replaced by the filter summary control (see Filter Summary in .NET Search Interfaces). 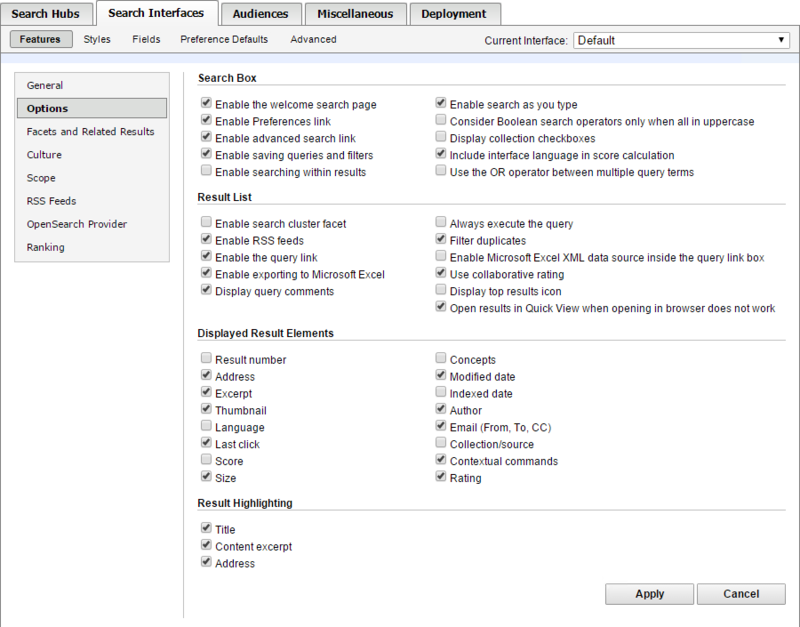 Always execute the query When the Enable the welcome search page option is cleared, select this option to ensure that the default hidden query associated with a search interface is executed when a user starts a session or initiates a search with an empty search box. Example: In the My Emails search interface, with this option selected, the search results can by default show the most recent email messages. Filter duplicates Select to eliminate similar results from the search result list. This option is useful to prevent viewing two or more instances of a document when copies of a document or similar documents are present in one or more indexed repositories. When this option is active and duplicate documents are filtered out, a message with a link appears at the bottom of the search interface to allow end-users to include the filtered documents in the search results. When the end-user chooses to show duplicates and duplicate documents are detected, a message with a link appears at the bottom of the search interface to allow users to hide them. This option is activated by default in several out-of-the-box search interfaces. Note: Clearing this option can reduce the query response time as search result documents would not be compared to identify duplicates at query time. Enable Microsoft Excel XML data source inside the query link box Select to include the Microsoft Excel XML data source box in the query link dialog box. Users can then copy the link in the box and use it in Microsoft Excel as a data source. Use collaborative rating Select to activate collaborative rating in this search interface (see What Is Collaborative Rating?). The three stars appear in each result allowing users to rate documents (see Rating a Search Result) only when the Rating option is selected under Displayed Result Elements. Display Top Results icon Select to show the star icon to identify Top Results (see Administration Tool - Top Results Menu). The icon appears at the end of the title. When cleared, no icon appears and the user cannot know that the result is a Top Result. Note: Top results must be defined individually by the Coveo administrator using the Administration Tool (see Adding Top Results to a CES Index). Open results in Quick View when opening in browser would not work Select to automatically open a result in Quick View as an alternate method when the browser cannot open the document. This option is useful for example for file share documents that cannot be opened with all browsers without configuration or without a plug in. When the option is selected, CES detects the client browser and rather opens the result in Quick View when it determines that the browser cannot open the result directly. When the option is not selected, the user will see the browser error when the result cannot be opened. Refer to the following figure and table to understand the options available under Displayed Result Elements. The result number appears when the Result number option is selected. The document language appears when the Language option is selected. The date at which the document was last modified appears when the Modified date option is selected. The ranking score percentage value appears when the Score option is selected. The miniature graphical representation of the item appears when the Thumbnail option is selected. The text excerpt appears when the Excerpt option is selected. The list of concepts extracted from the document appears when the Concepts option is selected. The time elapsed since the document was last indexed appears when the Indexed date option is selected. The item address appears when the Address option is selected. Various contextual links appear when the Contextual commands option is selected. The three stars appear to indicate and allow rating when the Rating option is selected. The indication of when the item was last opened by the current user appears when the Last click option is selected. The document size appears when the Size option is selected. The indication of the collection and the source in which the document is indexed appears when the Collection/source option is selected. Result number Select to show an increasing number on the left of the result title. The number indicates the rank in the current sorting order. This option is useful when users want to precisely identify a result when scrolling back and forth in result lists. Address Select to show the URL or the path of the search result item. This option is useful when a user needs to identify the exact location of a document. Note: Users can click the ellipsis (…) to fully expand a collapsed address. Excerpt Select to show a text excerpt that generally contains an occurrence of the searched terms. The excerpt appears below the title. The excerpt is a very useful search result element that users can refer to evaluate the context in which search terms appear in the document. The Coveo administrator can specify the default number of excerpt lines (see Modifying Default .NET Search Interface Preferences). Similarly, users can personalize the number of excerpt lines (see Modifying .NET Search Interface Preferences). Thumbnail Select to show a miniature graphical representation of the item. The thumbnail appears on the right of the result elements to help the user to visually identify the content of the document. Thumbnails are available in Coveo results for Microsoft Office documents (when a thumbnail is included in the original document) and for supported picture file formats (see Supported File Formats). Language Select to show the detected language for the document (see Supported Languages). The language identification appears at the end of the title. This option is useful when indexed repositories contain documents written in many languages to help users quickly identify the language of each document. Last click Select to show the information about when the result was last opened by the current user, from any search interface. Nothing appears when a result has never been opened by the current user. This information helps the user to identify that he previously viewed a result, and when he viewed it. Score Select to show the percentage value for the ranking score (see Understanding Search Results Ranking). The percentage value appears on the right end of the title line. This option is useful when results are sorted by a criterion other than relevance. Size Select to show the size (in bytes) of the document. The size value appears at the end of the document address line. The size value is useful to evaluate the scale of a document. Concepts Select to show the list of concepts extracted from the document. The list of concepts appears below the excerpt. Modified date Select to show the date at which the document was last modified. The date appears on the right of the title line. This option is useful to identify the freshness of the document. Indexed date Select to show the time elapsed since the document was last indexed. The information appears between the concepts and the address. This information is useful to identify the freshness of the indexed content. Author Select to show the author when available and extracted from the document metadata. The author name appears on the first line after the title. Email (From, To, CC) Select to show the From, To, and CC lines to respectively indicate the sender and recipients for email or conversation search result items. The lines appear directly under the title. Collection/source Select to show the name of the collection and source in which the document is indexed. Contextual commands Select to show various links such as Quick View and Details. The links appear on the last line. Users can click the links to trigger new result related searches. The availability of command links depends on the search interface and on the result type. Possible contextual command links are: Quick View, Details, Attachments, Emails to/from, Meetings, Contacts, Search in conversation, Folder. Rating Select to show the three stars on the last line to indicate that result selection by users affect the document rating. The users can click the stars to set their personal appreciation for a result only when the Use collaborative rating option is selected under Result List. Highlighting searched terms (generally text in bold) is useful to help users to more easily locate the searched terms in various search result elements. Refer to the following table to understand the options available under Result Highlighting. Title Select to enable highlighting of searched terms in the title. Content excerpt Select to enable highlighting of searched terms in the text excerpt. Address Select to enable highlighting of searched terms in the address.